The desert is by no means a hospitable place, especially if you don’t have the ability to seek shelter from the unrelenting heat of the sun. But a single tree managed to survive the arid wasteland for several hundred years. What it couldn’t survive, however, was a careless truck driver who somehow managed to hit the only obstacle in a 800 km (500 mile) stretch of wasteland. 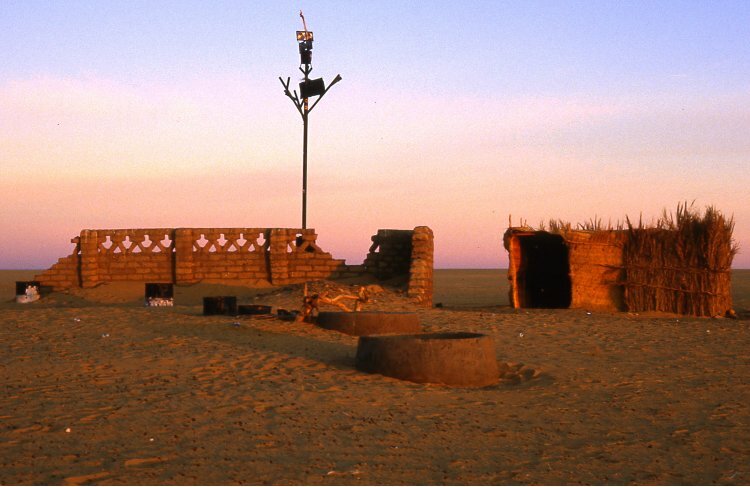 The Tree of Ténéré was an acacia tree (although it actually belonged to the vachellia genus) located in the Ténéré desert in northeastern Niger, and despite its fame for being solitary, it was once part of a much larger grove of trees. In fact, thousands of years ago the area was likely entirely covered in forest. As the climate changed over time and rainfall became more scarce, the number of trees dwindled. While it isn’t the only tree in the desert, by the time it was recorded for the first time by Westerners, it was surrounded by more than 400 km (250 miles) of nothing but sand in all directions. Virtually all local maps featured the tree, since it was one of the only notable features of the landscape. As a result, it became a local landmark, used to guide caravans and travelers as they made the dangerous journey. For hundreds of years traders led camels carrying salt, dates, and other goods through the desert, all stopping at this one sacred location. When the commander of the Allied Military Mission, Michel Lesourd, saw the tree in 1939, he was astonished that anything could live in such conditions. One must see the Tree to believe its existence. What is its secret? How can it still be living in spite of the multitudes of camels which trample at its sides. How at each azalai does not a lost camel eat its leaves and thorns? …The only answer is that the tree is taboo and considered as such by the caravaniers. The tree’s role as a ‘lighthouse’ of the desert and gathering point eventually led to officials drilling a well in 1938. As they drilled deeper and deeper to find a source of life saving water, they discovered how the tree had managed to survive for so many centuries – its roots crept 35 meters (110 ft) beneath the surface and into the underground source of water. The tree itself was only a couple of meters tall with few living branches, but it still clung on to life to serve as a testament to the resilience required for hardy desert people to survive. But a double whammy of back luck would cut the tree’s life short – literally. 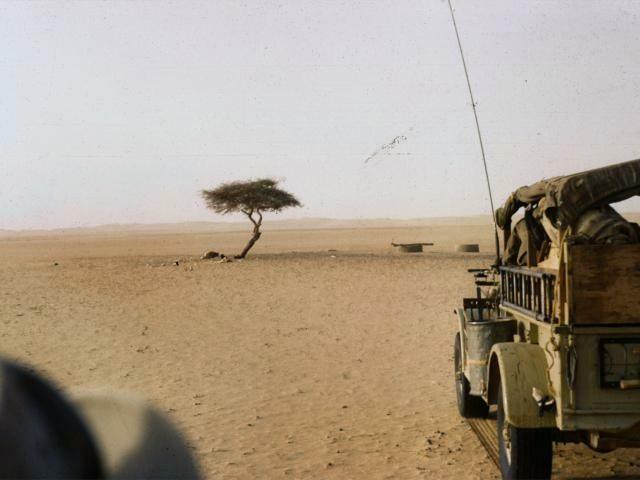 The Tree of Ténéré’s first run in with automobiles came some time in the 1940s, when a careless driver somehow smashed into it with his trunk, knocking down one of its two brittle trunks. The driver then hacked the tree off at the stump, likely in an effort to hide what he had done. The tree which was so special to the local people was irrevocably damaged, but managed to survive the incident. It was another absent-minded truck driver that would eventually bring an end to the tree’s story. In 1973, the final remain trunk was struck by a Libyan truck driver, snapping it in half and killing the tree. There is some speculation that the driver was drunk, but there is no proof that this is true. Perhaps he was asleep at the wheel, or a sudden wave of dust obscured his vision. In any case, after hundreds of years, the tree met the same fate as the rest of its kin. 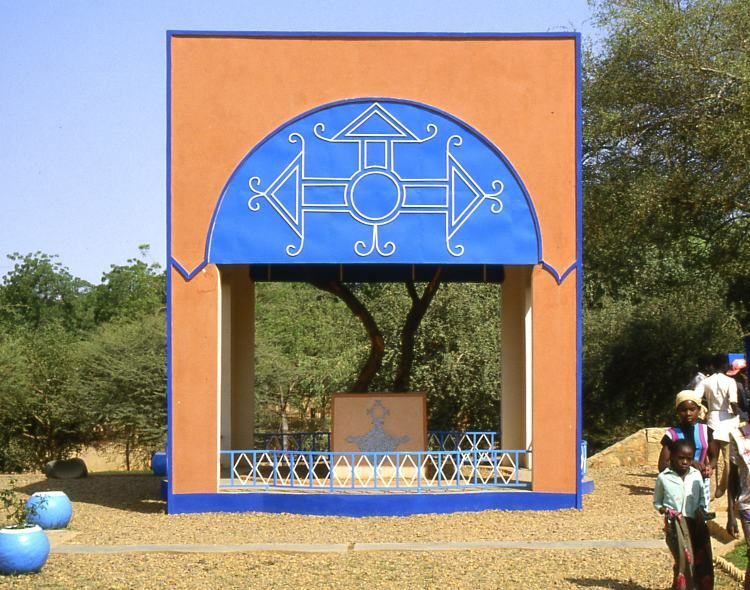 The tree’s remains were taken to the Niger National Museum in Niamey later that year, and a tribute was built in the tree’s place. The monument was made of scrap metal and can’t compare to the unique beauty of the original tree. It looks more like an antenna than a tree, but at least it’s something. A year after the tree’s demise, the Republic of Niger released a commemorative stamp with a photo of the legendary tree. 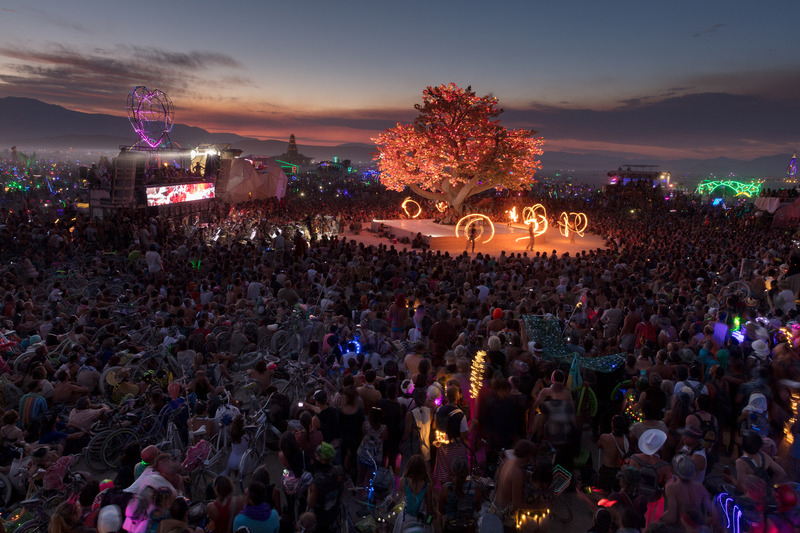 At the 2017 edition of the annual Burning Man festival another tribute to the Tree of Ténéré was constructed with the help of hundreds of donations from around the world. The three story tall installation featured more than 25,000 LED-infused leaves that lit up in coordination with music and movement. We were inspired by a tree that once grew in the middle of the Sahara desert, in a region called Ténéré. 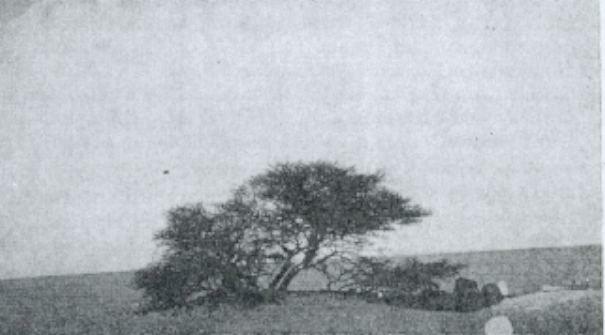 It was the most isolated tree on Earth: not a single other tree could be seen for 250 miles. And yet, the tree became an important ceremonial gathering place for traders and travelers as they crossed the desert. It brought people together for community, ritual and rest. Although the tree has been dead for more than 50 years, its legend lives on. The tree’s incredibly ability to survive in the otherwise desolate wasteland was only surpassed by its poor luck. The only real mystery left in the story is how in the world two separate drivers managed to hit the only living thing for hundreds of miles. If you enjoyed this article about the Tree of Ténéré, check out the archive for more tree stories. Also check out the Facebook page, with a few extra tree goodies throughout the week. Subscribe below to receive notifications whenever a new tree story is published. One really needs to put a lot of effort into a botch like that! I have wondered if it was deliberate… but I choose to believe it was just an idiot. The bigger mystery of the tree is how a once lush green forest disappeared and turned into a desert wasteland. A desert appears not merely because rain stops falling, but because the soil becomes unhealthy. Large areas of plants and trees “command” rain to come. Because leaf transpiration increases the moisture content of the area which eventually forms clouds. As seen in the rain forests. Once the soil becomes damaged the majority of plants and trees start dying. When the plants die then the rain stops and the area turns dry. Eventually this causes a feedback transforming the area into a desert preventing forests from growing. I suspect that it was the long term use of destructive agriculture and overgrazing of domestic cattle that destroyed the soil. It’s worth keeping in mind that it has been a desert for nearly 5000 years. Most of its time as a lush forest was during the neolithic era (check out ‘Green Sahara’), but there is some information about Tenerians who lived there at the time. They were herders, but I can’t say what exactly caused the region to dry up. As far as I know the desertification of the Sahara is still somewhat of a mystery! Thank you for the information. It is a very interesting subject. I was reading a little bit about the Green Sahara. If I understand correctly the Sahara started turning into a desert between 5000 and 12000 years. It could also be possible that the desertification causes did not have to originate at the Sahara in Niger. For example it might be that farmers and pastoralists around the Nile river and other places in the Sahara reduced the natural vegetation causing ecological changes through changed albedo that increased temperatures. I do agree that climate effects not caused by humans played a role too. Probably there were several different causes happening at the same time. After all the Earth’s biosphere is a vast and highly complex inter-dependent open system. Whatever the mystery is..I hope that one day the deserts will turn green again. Have a good day. I enjoy your articles. Very interesting! By no means am I an expert on the subject, so you might be right. Thinking and reading about the Green Sahara reminds me of the classic book Dune. Some day I’d like to tackle some fictional trees and worlds, as well. A beautiful story that ends in human calamity – the term ‘doh!’ comes to mind, although perhaps that doesn’t quite capture the scale of the tragedy. This is probably the most poignant narrative I’ve experienced on a life in the plant world. I settled on ‘unfortunate’ for the title, but it’s difficult to put into words what was lost. I wish there were more records from local people at the time, but I wasn’t able to find any… In any case, not all stories have happy endings! Thank you for telling this tree’s story. How beautiful and sad. How sad! What a beautiful monument the tree was! I have never heard of this tree before. Now I feel unspeakably sad at the mindlessness of man.